Blasts from the past for local students of history. Thanks to the University of Memphis and Rhodes College (and not to slight the ongoing efforts of other collegiate institutions), last week was a good one for connoisseurs of history. Early in the week, the U of M Student Government Association brought together for an informal discussion at the university's Rose Theater two august political figures from the recent past — both of them, Democrat Howard Dean and Republican Fred Thompson, former presidential candidates and both of them experienced in both the highs and the lows of political life. Dean, it will be remembered, was the high-flying outlier candidate of 2003 who soared above the rest of his party's presidential field until the very moment when it began to count — the Iowa caucuses of January 2004. It was then, legend has it, that something called "the Dean Scream" occurred, subsequently dooming the former governor of Vermont back to the obscurity from which he had emerged. So goes the story — or the "meme," as political aesthetes say these days, using that modish term to designate the kind of ready-made paint-by-the-numbers conclusions that become staples of pack journalism and, often as not, enter into historical accounts to the detriment of reality. The fact is, as Dean readily acknowledged, he was well on his way to defeat by the time he took the stage on election night in Des Moines to greet his supporters. He had just finished third in the caucuses — behind eventual Democratic nominee John Kerry and John Edwards, who would wind up as Kerry's running mate. Given Dean's earlier long-lived supremacy in the race and the fact that next stop on the campaign trail after Iowa, then as always, was New Hampshire, Kerry's neighboring state, the game was already over. Those who were there for Dean's speech (beginning the previous summer, I had covered Dean's candidacy and was in Iowa but was holed up on election night in Cedar Falls) describe the environment of the hotel ballroom where Dean spoke as so noisy (read: still hopeful and enthusiastic) that the inevitably chastened candidate had to shout merely to be heard. At a certain point, he yelled out a meant-to-be inspiring war cry that became — "The Scream." But his hopes of being nominated, as he noted in a conversation after his public remarks, were already over with. "The Scream" was just the national media's way of short-handing the fact and avoiding serious analysis of the actual causative factors — including the media's own itch for a new twist and a new leader, something that had inevitably affected coverage. In a post-event conversation, Thompson also shed some light on one of the overlooked reasons for his own failure to catch fire in the Republican campaign season of 2008. He had entered late for one thing, in the fall of 2007, well after months of initial ballyhoo for his likely candidacy. This tardiness by the former Tennessee senator, also an actor and lawyer of note, had been observed by reporters but never properly explained. Something which went entirely unremarked was the fact that Thompson had been starring throughout the TV season of 2006-2007 as district attorney Arthur Branch in the long-running NBC series Law and Order. And he was loyal to the folks who had brung him to that dance, as well as cognizant that, if he had declared for president and begun running in the late spring of 2007, after the season proper, he would have made it impossible for reruns to air that summer, depriving the network, the producers, and the rest of the show's staff and actors of the hefty revenue that normally comes from such re-airings. "And, to be honest, I also needed to raise some more cash myself," Thompson added. 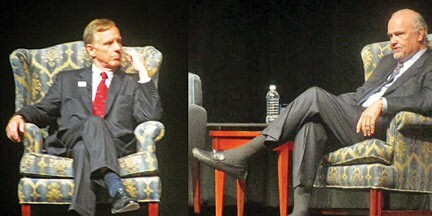 In their public remarks, both he and Dean were candid, and, despite the political gulf dividing them, they found agreement on numerous points — including the deleterious effect on this year's presidential campaign of the U.S. Supreme Court's "Citizens United" ruling, which effectively erased all previous curbs on special-interest financing of campaigns. Both had good moments at the U of M, and Thompson in particular demonstrated that he still had both a fine sense of modesty and a good ear for dialogue. Asked by the event's moderator to what he attributed his defeat in 2008, Thompson quipped, "The abiding good judgment of the American people." 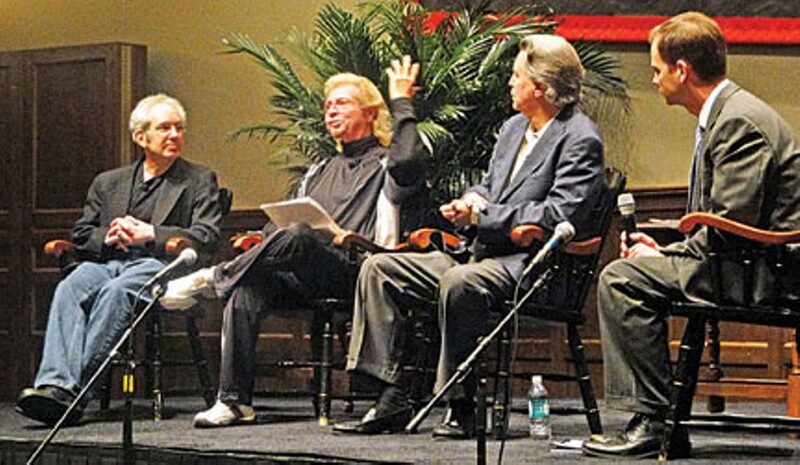 • Another event, at Rhodes College, later last week was not expressly political in itself, but it brought together three notable individuals who represented one of the pivotal upheavals of American and world history, one that both reflected political and social change and helped create it. The avatars in question were Peter Guralnick, the peerless (and tireless) chronicler of America's musical watershed moments — Elvis Presley (Guralnick's two-volume biography is the standard), Sam Cooke, Robert Johnson, and soul music and the blues in general, just to name a few of his subjects; Knox Phillips, the son of legendary Sun Records producer Sam Phillips, a peerless raconteur, and a studio presence in his own right; and Mike Curb, chairman of Nashville-based Curb Records, the former head of such labels as MGM and Verve and the founder of the Mike Curb Institute for Music at Rhodes. The theme of the evening, entitled "Sun, Sam Phillips, and the Spirit of Memphis Music," was perhaps familiar but all the more gratifying for hearing about it again: the fusing of ethnic cultures (white, black, and what-have-you) by means of the cosmic release that was rock-and-roll music and, especially, through this city's indispensable contribution to that ultimately international phenomenon.